The Wildcat has been entered in various off-road rally raids, most notably the Dakar Rally. 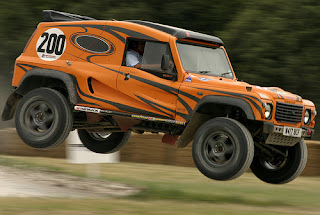 The Bowler Wildcat is an off-road vehicle originally made by Bowler Offroad, it is an evolution of the Bowler Tomcat which is based on the Land Rover Defender. The manufacturing rights to the Wildcat were sold by Bowler to Qt Services in December 2007, to provide support to existing Wildcat owners while Bowler concentrated on production of their newer vehicle, the Bowler Nemesis. Since then, QT Services have continued to support owners in competitive events and have made further developments to the vehicle. The Wildcat has a tubular space frame construction that incorporates a roll cage as an integral part of the frame structure. The body panels are made of glass-reinforced plastic. The suspension system uses Land Rover Discovery beam axles front and rear. The front axles are located by radius rods and a Panhard rod. The rear axle is located by trailing arms and Watt's linkage. Bowler originally offered the Wildcat with a choice of 4, 4.6 or 5 litre displacement V-8 engines in several levels of engine tuning, or a 2.5 litre turbo diesel. An optional feature offered by Bowler was a lift device that could lift the vehicle past the lowest travel of the front and rear suspension. The lift was intended to be used to assist in digging the vehicle out of soft ground or to facilitate changing a wheel. The lift device consisted of a large steel plate on a hinged sub-frame attached to the underside of the vehicle frame between the front and rear axles. The lift was lowered by a hydraulic ram that was controlled from inside the vehicle. The lift plate also served to protect the underside of vehicle when raised. You need to either credit that photo to me and link to my flickr page or take it down completely.